The Presage® ST2 Assay quantitatively measures the concentration of soluble ST2 in plasma, providing a physician with an accurate tool to assess prognosis in patients with chronic heart failure. What follows is a brief explanation of the science behind ST2. 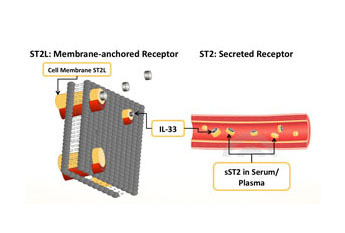 The two key isoforms of ST2 are ST2L (a membrane-bound receptor) and sST2 (a soluble form found in the bloodstream). The response of healthy cardiac tissue to injury or mechanical stress involves the production and binding of interleukin-33 (IL-33) to ST2L, which stimulates a cardioprotective signaling cascade that defends against fibrosis, stiffening of the heart (cardiac remodeling), and heart failure (HF).2 Heart failure is a progressive disease which has not cure and which requires ongoing treatment. When sST2 levels are elevated, however, sST2 will bind to IL-33, thus reducing the beneficial effect of IL-33 through the ST2L receptor, so that cardiac fibrosis starts to develop (Fig.1). In this way sST2 is a biomarker for worse prognosis in patients with cardiovascular disease. ST2 concentration elevation precedes an overt change in a patient’s symptoms, reflecting a worsening in the patient’s disease status. Plasma ST2 thus predicts which chronic HF patients are progressing towards worsening HF and cardiac remodeling, so that treatment can be implemented to improve the risk profile. Fig. 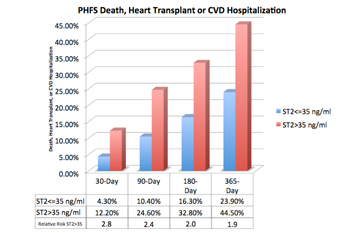 2 Effect of high ST2 levels on clinical outcomes in the Penn Heart Failure Study (PHFS). Kakkar R, Lee RT. The IL-33/ST2 pathway: therapeutic target and novel biomarker. Nat Rev Drug Disc 2008;7(10):827-840. Ahmad, Fiuzat M, Felker GM, O’Connor C. Novel biomarkers in chronic heart failure. Nat Rev Cardiol 2012 Mar 27 [E-pub ahead of print]. Ky B, et al. High sensitivity ST2 for Prediction of Adverse Outcomes in Chronic Heart Failure. Circ Heart Fail 2011;4(2):180-7. Felker GM, et al. Soluble ST2 in ambulatory patients with heart failure: association with functional capacity and long term outcomes. Circ Heart Fail 2013, Nov;6(6):1172-9.